Dr. Gonzalez was born and raised in San Antonio, Texas and attended Central Catholic High School. He received his Bachelor of Science degree from Stanford University. He then attended The College of Physicians & Surgeons at Columbia University where he was awarded his Medical Degree. His residency in General Surgery was completed at Harvard University/Massachusetts General Hospital. 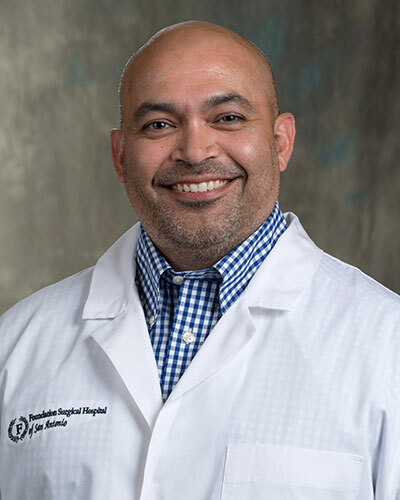 Dr. Gonzalez received advanced laparoscopic training under the tutelage of world-renowned laparoscopic surgeon Dr. Morris Franklin at the Texas Endosurgery Institute. During his 2-year fellowship at TEI, he received additional training at the Institut de Recherche Contre les Cancers de l’Appareil Digestif, a minimally invasive surgery center in Strasbourg, France. He also studied foregut and weight loss surgery at the Wakefield Clinic under Dr. Richard Stubbs in Wellington, New Zealand. Dr. Gonzalez offers sleeve gastectomy, RYGB, gastric banding, gastric plication, revisional bariatric procedures, as well as general surgery procedures. Dr. Gonzalez is the author of numerous journal articles and book chapters in the field of laparoscopic surgery. He has given oral and poster presentations at more than 15 international meetings and has been on the teaching faculty at the Society of American Gastrointestinal Endoscopic Surgeons (SAGES) annual scientific sessions and at the XII International Congress of Endoscopic Surgery in Veracruz, Mexico. Dr. Gonzalez is also a proctor for Allergan for whom he teaches surgeons from all over the country how to perform laparoscopic adjustable gastric banding. Dr. Gonzalez is board certified in general surgery with the American Board of Surgery and is a member of the American Society for Metabolic & Bariatric Surgery.